A few days ago we had the pleasure of these wonderful surprise visitors. A swarm of honey bees descended on our breakfast deck at Aan de Oever Guest House, decided to move in, making themselves very comfortable under one of the outside deck tables. Realising this was not an option as we had guests milling about, the bees had to go! 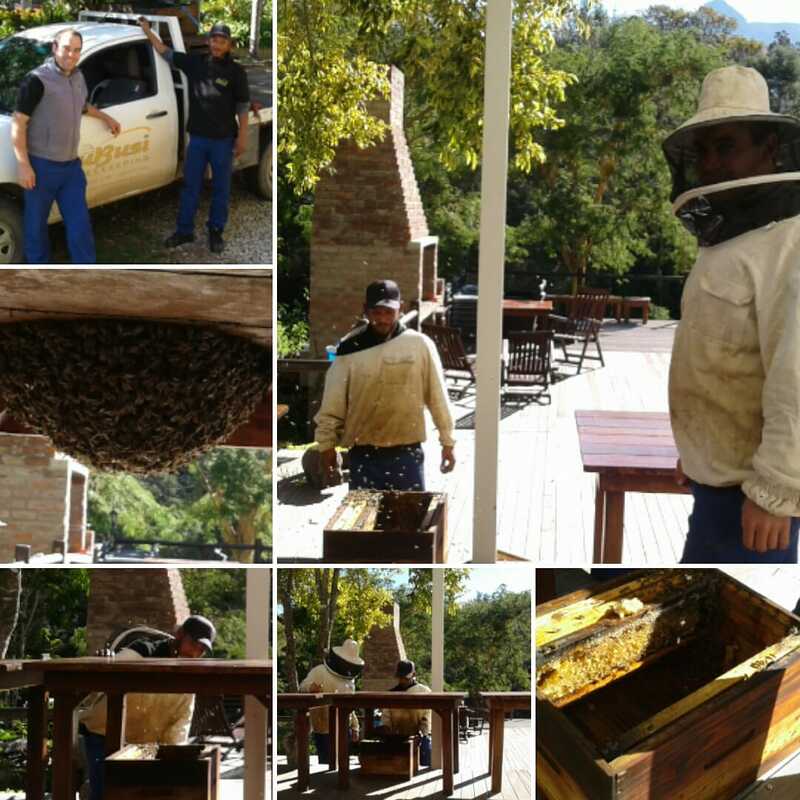 We called our local bee hero’s – Ubusi Beekeeping – to come save us and the precious bees. Ubusi Beekeeping (Pty.) Ltd. is a unique primary agricultural and Agri processing company, covering different sectors in the Apiculture and Tourist industry. During the past six years, the reputation of the Company has grown immensely thanks to Mr. Jaco Wolfaardt, who’s vision is to expand the supply of beekeeping equipment and services to other hobbyist beekeepers and beekeeping development projects, in the Western Cape and other regions in South Africa, for sustainable honey production and pollination services, with his main objective to unite South African Beekeepers for the creation of a world export commodity. A swarm of bees cause alarm and frightens people, though the bees are usually not aggressive at this stage of their life cycle. This is principally due to the swarming group’s lack of developing bees to defend and their interest in finding a new nesting location for their queen. This does not mean they will not attack if provoked. Bees tend to swarm near their hives or honeycombs, so if a swarm is visible then a nest is nearby. It is important to keep a good distance from swarms in order to avoid upsetting them, call your local Beekeeping Hero’s to come and assist if needed! It’s wonderful to watch and a great deal learned, thank you.